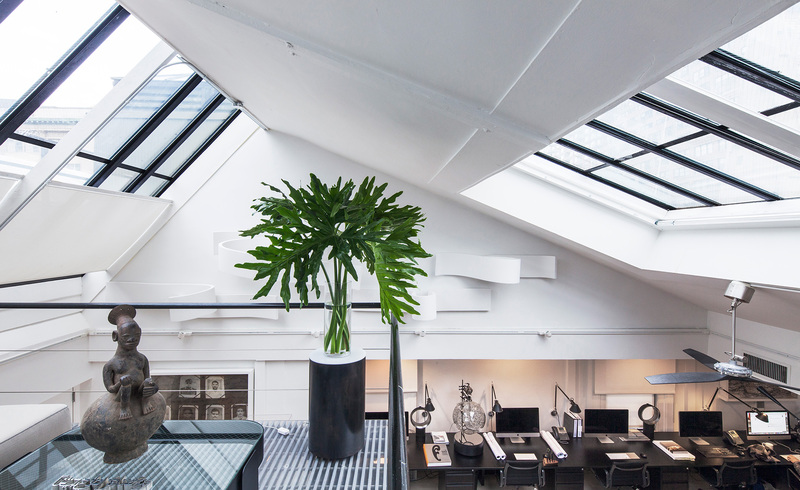 Re-locating the studio from a loft just off Union Square to a penthouse on Fifth Avenue in Manhattan’s NoMad neighborhood, the space was renovated to create an open plan studio, exhibition space and urban salon. Guided by the tenets of gesamtkunstwerk—engaging multiple disciplines to create aesthetically cohesive environments—the space reflects the studio’s multi-disciplinary practice of interior design, art and furniture design. In a glass cube directly beneath a mezzanine space with views of The Empire State Building, are selected artwork from Aharoni’s recent museum show in India, Missives, Genesis Series assemblages and the most recent sculptures, The Road to Sanchi. The centerpiece of the studio is an eleven-and-half foot long table of 300-year-old American Black Walnut designed for the space. It functions as the communal axis of the space for studio lunches and design meetings, as well as a gathering place for evening salons hosted monthly in the studio. In the concealed, fully-equipped kitchen—with a custom designed, polished stainless steel countertop and backsplash—recipes from the studio’s forthcoming cookbook are prepared for studio lunches and evening salons, melding the pleasure of work and life.